Packing interesting, nutritious lunches for your child each day can be a headache. After figuring out what they’ll actually eat, you need to put it in the right container — but where did that matching lid go? Are there any zip top bags left? Eliminate the unnecessary stress by using a bento lunch box each day instead. Bento lunch boxes are convenient, safe, and fun ways to pack your child a lunch they’ll enjoy eating. Here’s what separates them from a traditional lunch box and why you’ll never look back once you try bentos. 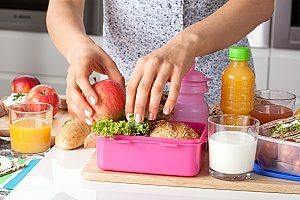 A traditional lunchbox or lunch container typically has just one compartment in which to store all of your child’s food. A bento lunch box, however, has multiple compartments. This provides you with several benefits when packing lunches. First, it allows you to use just one container to pack multiple types of food, saving time and space by requiring you to look after just one container each day. Second, the compartments can provide easy portion control. With some spaces larger than others, everything from veggies to sweets can be perfectly portioned for a nutritious lunch. Finally, using multiple compartments in one box makes it easier than ever to pack a variety of textures and flavors. You’ll never have to worry about fresh carrots accidentally creating a soggy sandwich, as everything will have its own, separate place. Classic lunch boxes may offer little in terms of insulation. Some are designed to keep foods cold, with no mechanism for keeping them warm if necessary, while others do not regulate temperatures at all. A bento lunch box, however, can solve that issue. Kangovou’s lunch boxes are made of double-insulated stainless steel. This means that hot foods will stay hot and cold foods will stay cold, without the temperature transferring to the outside of the box. Not only will each box remai easy to handle all day long, it will also keep everything at just the right temperature until lunchtime. There’s no need to worry about ice packs, microwaves, or other annoyances. Lunch boxes can be made from a wide variety of materials, from fabric to metal to plastic. Many, however, are made of plastic, which can be harmful to children. Certain plastics, such as BPA, have been known to cause a variety of health problems, including cancer, reproductive concerns, and hormone imbalances. 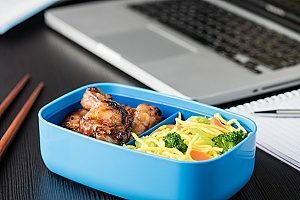 To minimize the risk of exposure to harmful plastic, purchase a bento lunch box that is made of metal and BPA-free plastic. There’s no need to sacrifice safety for convenience, and the right bento lunch box will easily give you both. Many parents pack their children’s lunches in multiple containers. Some use several plastic containers, while others may constantly turn to tin foil and zip top bags to bundle everything up. A bento lunch box eliminates the need for all of this waste. Instead of purchasing extra boxes, bags, and other wrappings, parents can buy just one container designed to hold it all. Not only does this cut down on waste and benefit the planet, it also benefits the amount of extra stuff floating around your house. Why waste time searching for just the right lid or bag, when everything you need can easily get washed, stored, and packed in just minutes? With a bento lunch box, you’ll never have to. Beautiful lunches may not be high on anyone’s priority list — after all, most days it’s a small miracle that lunch got packed at all. A bento lunch box, however, can encourage creativity and make everyone’s day a little brighter. Traditionally, bento lunch boxes are meant to showcase artfully arranged food in the shape of flowers, animals, and anything else you can dream up. Instead of going through the effort of making turkey slice petals, parents can use the bento box as inspiration to pack themed lunches and other surprises. Try an all-green lunch one day full of veggies and a minty chocolate for dessert, or a breakfast for lunch special complete with syrup. Creative lunches can break up the monotony of a sandwich and apple combo, helping picky eaters look forward to lunch again. Purchase your bento lunch boxes on Kangovou.com. The company is dedicated to creating lunch boxes that are free of harmful chemicals and can store your child’s lunches in a safe, healthy way. Kangovou’s containers provide the ideal insulation for each meal. They have multiple compartments, making it easy to pack healthy lunches and saving time on cleanup later. The boxes are also easy to store and take anywhere. Consider purchasing a Kangovou lunch box to ensure that your child gets the best lunch possible each day and to give yourself the peace of mind in knowing that they and their food will stay safe.